The new Charter ISO 9650-1 raft is an upgrade of the existing Charter liferaft and has been developed to meet the needs of all boat users and complies with MCA code of practice requirements. 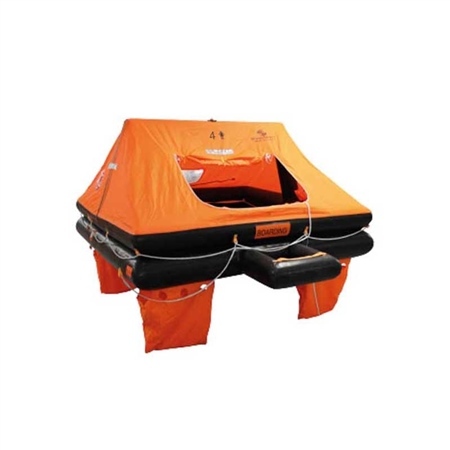 The raft is available with a less than 24-hour pack as standard. The new valise is more of a rectangular shape than the older version, making it easier to pack away on your vessel. Less than 24hr pack as standard. Manufactured using commercial quality rubber and approved to ISO 9650-1. Canister and valise options available. High visibility canopy for easy location. Automatic lighting system to aid location. Clear visibility window for look-out. Retro-reflective tape to increase visibility. 4 x 55-litre water pockets for maximum stability. Boarding ramp handles for quick boarding. 2 x Para rocket flares. 1x Throwing line - 30m.